Blerg... I just got going and I'm already sick. 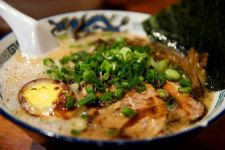 I'm staring longingly at my ramen as I type this. Oh precious ramen, you make me so happy. If I made a game about ramen, what would it be about...? Perhaps a Ramen Food Critic game. In it, you research your publication audience, learn about their lives, and choose words that best describe the food and best match your audience's style. Your critiques help influence chefs towards ultimately crafting (and you eating) THE ULTIMATE BOWL OF RAMEN. There would be intrigue, too, with folks that have a big investment in having their ramen rated well, that threaten you and stuff. Maybe you have to make the right ramen friends. Oh, and you can help sick people get better with good ramen. Mmhmm. There have been a lot of good games about perfectly pedestrian things. Making a pedestrian subject seem exciting is something Japanese manga excels at. Which reminds me, I just finished the first Phoenix Wright... I should write about it.